The M10 tank destroyer is the third kit in the Armourfast range now being produced by HäT Industries aimed at the wargames player. 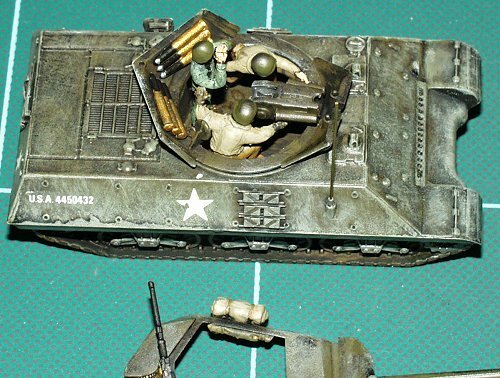 On opening the box one is confronted with two very basic kits of the M10 tank destroyer, but with a little help from the spares box one can turn this basic kit into something special. 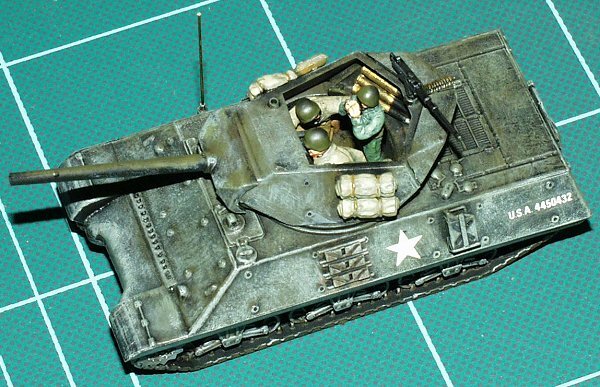 As the M10 has an open top turret one will need to put in a crew to serve the gun. The quick way of doing this is to cut off some suitable figures at the waist, but I wanted to take things a step further. What I wanted to do is cut out the turret floor and insert a cage so that I could put some full length crew figures in to serve the gun and include some more detail. The first thing one has to do is to drill out the turret ring from the base using a power tool with a burr, and then cleaning up with a sanding drum attachment. Next we have to drill out the hull top with the same drill attachments. You should be left with a 25mm ring in both the floor of the turret and hull top into which you fit the turret cage. The construction of the turret cage is quite simple. You will need a circle cutter which can be obtained from any good art shop. Out of thin plastic cut a circle 23mm in diameter for the floor of the cage and then four 4x7mm hangers to suspend the floor from the turret base. Glue the four hangers to the cage floor and turn the turret upside down and glue the other end of the hangers to the turret floor. Before gluing the two halfs of the turret together one can carry out some detailing to the inside. 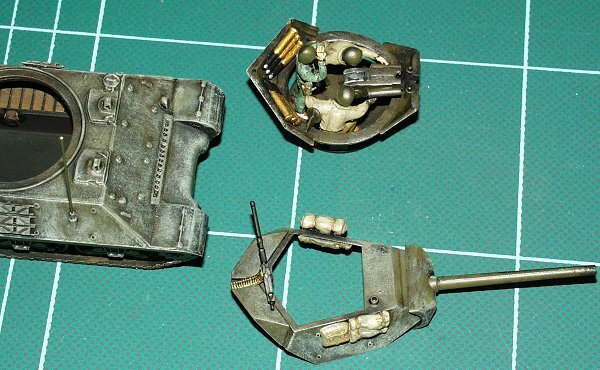 You will need six shells to fix to the turret back wall [three either side] you may have these in the spares box I took mine from an old ESCI Elefant kit . The 88mm and 75 mm were roughly the same length. A gun breech was taken from the same kit and cut down to fit into the turret. Looking from the front to the back of the turret two flip up seats are located one at 11 oclock and one at 2 oclock. I took these from an old Airfix 88mm gun. Bed rolls were made from Duro and hung on the outside of the turret. Another dip into spares box produced some jerry cans and spare track links. 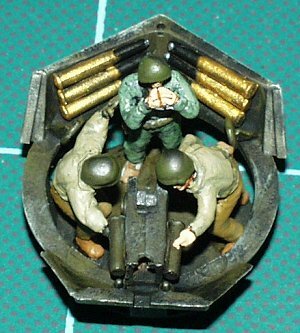 The next job which turned out to be the hardest was to find and convert a crew for the turret. I finally settled on three figures from the ESCI Nato pilot and ground crew set. Helmets were shaved off and US style helmets were fashioned from Duro. Some shaving down of the torsos was also required, and then new jackets were fashioned again from Duro. The gun commander was made as above, his two arms were cut off and new ones made by bending thin wire and again covering with Duro. As there are no decals supplied with the kit I had to look in my own stock to find suitable Stars and numbers. 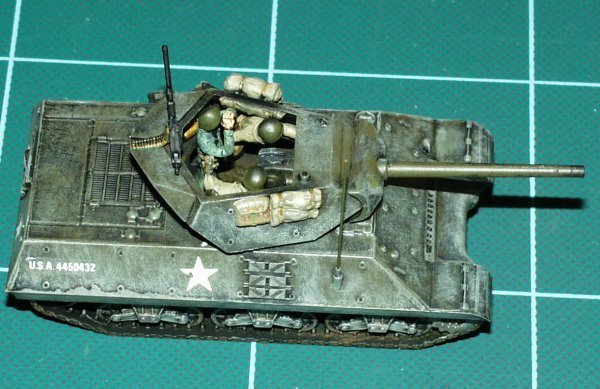 After carrying out the above conversion I came to the conclusion that this kit would be very suitable for someone who is dipping there toe first time into converting kits as with a little care one can end up with a very nice representation of the M10 tank Destroyer.